This post is really designed for my family and friends. I write it because in the business that I am in I get to see hear the detrimental impact web based threats have on people. I hear horror stories of lost data, the amount of information they have lost and the impacts it has had on them and their businesses. I by no means will cover all the things that you should do, but it will help better situate your online security posture. Understand that when reading this there are many variables that have to be accounted for when talking about protecting yourself and not everything is under your control. The web is such that we have grown accustomed to what it offers us and now we have to learn to adapt. Many of you get a wide range of emails and your first reaction is often to click on the link. While the web continues to be the number one distribution mechanism of malware, email attacks are on a rise. The latest reports tell us that spear phishing attempts, that’s what it is called, is on the rise. They often embed links to compromised website and carry a myriad of infections within those sites. Here are a couple of things I would recommend. 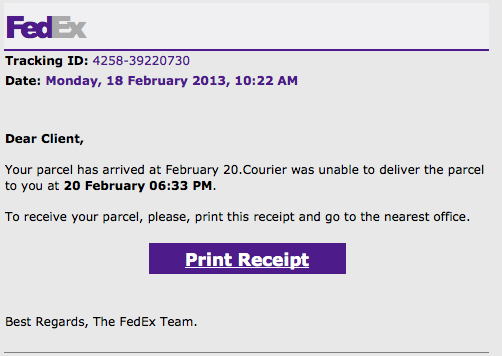 In this example it’s pretty clear that it’s malicious. The email name – xEYxqGtYj@romeolio…… – is the first red flag for me. The name of the link and file is another red flag. From this, I know it’s a Joomla site that has been attacked, and they’re leveraging the default BEEZ template. Granted, you probably wouldn’t know that, but by looking at it you could deduce there are a number of red flags with this engagement. Enough to hopefully raise some level of suspicion. The Web Is a Beautiful, Yet Dangerous Place!! You can love the ocean, but you must respect it as well. Most of you surf the web without a care in the world. There was a time that maybe that approach was acceptable and tolerable, but those days are no longer here. Making the mistake that today’s issues don’t apply to you is your first mistake. Second is not taking the appropriate precautions. I won’t go into a tangent on the subject but know that there are things that everyone should do if they spend any time on the web. Java has had it’s rear end kicked this year. To the point that I am feeling really bad for its developers, but the reality of things is that it just hasn’t been a good year. It’s been the contributing attack vector to company’s like Facebook, Microsoft and Apple – that’s just in 2013; we’re only 2 months into the year. 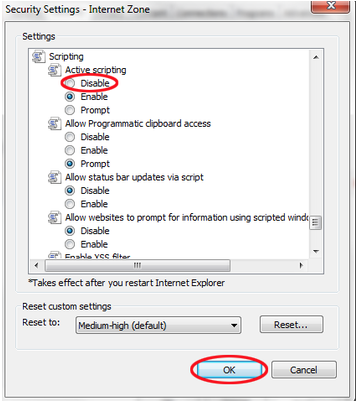 Firefox – Select “Tools” from the main menu, then “Add-ons,” then click the “Disable” button next to any Java plug-ins. This one is bit close and dear to my heart. Many people will complain about this, and make arguments about how much of an inconvenience it is. Whatever the argument, the threat is real. I would argue that JS is the preferred browser based technology being exploited by attackers. It’s perhaps the most popular browser based technology employed by most developers to improve the users experience. 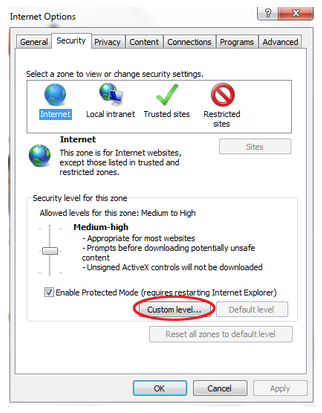 It comes enabled by default on almost every browser and doesn’t require any installs unlike ActiveX, Flash, and other similar technologies. I won’t get into the weeds on this and I’ll allow you to choose what you want to do, but if you are ok with a minor, temporary, inconvenience I recommend disabling. You can just copy and paste that into your browser and it should take you to the browsers settings page. If you trust the site add it to your exceptions and go about your business. What I dislike most about this is that it adds the exception for good, you’d have to go in and go through your managed exceptions to remove sites as required. That can be a bit annoying. If you’re wondering why I would do that it’s because even known good sites get compromised, see my post on NBC’s compromise about two weeks ago. That being said, this is still a good step to take. What I do is I use one browser with JS fully disabled and add exception for a very small list of sites I know are good and well maintained. 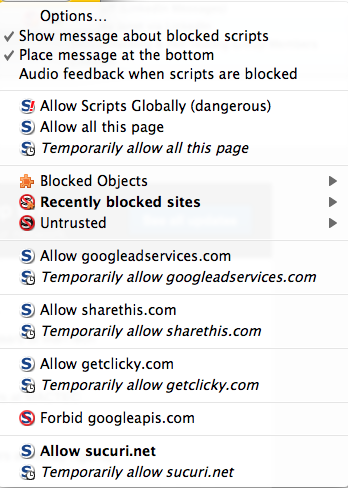 All other sites that I have to visit that require JS enabled are done on a separate browser all together. I usually like using Firefox as the secondary browser. When I do this I try not to visit many sites or open other tabs, the idea is to reduce the potential risk of cross site scripting and or cros site request forgery attacks. 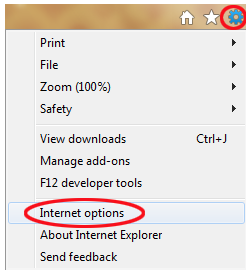 When you do this with the guidance below on what to do on FireFox it’s a pretty solid solution. I don’t expect most of you, if any, to actually do this. But do realize you have options. One other, very feasible option, is to use VMFusion or VMWare and run browsers in Unity mode. This will allow you to run the OS you are most comfortable with and run the browser from the virtual machine (VM). In this instance if you get a download attempt or accidentally get infected it affects your VM and the box you’re using for every day tasks. But I digress, this is a bit more for those paranoid few.. 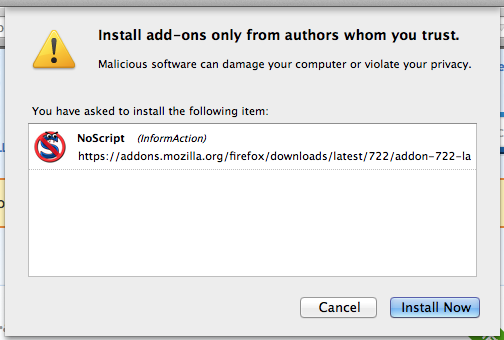 If you use FireFox, the easiest thing to do is install the NoScript plugin. You can try doing it via your settings, but it is less than user friendly and adding exceptions is a pain. You will need to restart the browser, so be sure you do that before proceeding. You can restart by simply forcing a quite or closing out your browser. 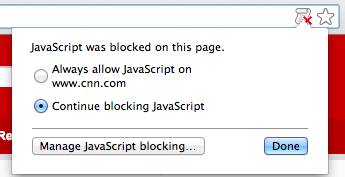 This is where I really like the Firefox option for handling sites that require JS to get anything done. If you combine this with my approach above it works well. It allows me to run JS on websites but allows me to verify what it’s loading and what I want to allow. If everything looks good I can add an exception for the current session. Yeah yeah, I know that half of you still use Internet Explorer for your daily browsing needs. While I would encourage you to switch, I realize it’s unlikely. Note that my recommendation for IE is simply because it’s such a large target, I am not saying it is more or less safe, just that it’s a preferred target for attackers. I personally don’t like that, and prefer not to put myself in that situation. That being said, knowing that you do, here is what you need to do. Just like, done sir done. I don’t run IE locally so I’m a bit unclear on the way to manage the exception, but I assume it’s as challenging as FireFox’s built in mechanism. As for the other browsers, they each have their own approach to handling JS I would encourage you to do a Google search. If any of this scared you, I do apologize for that, but I assure you that if you take a deep breathe and reread the post you’ll hopefully find that it’s not that mind boggling. Follow the instructions, after dealing with the momentary mental breakdown that will ensue, and force yourself to maintain a better online security posture. This is a very high level cursory discussion on a few things you can do, but I recommend you take notice and apply what you can. If large organizations are falling victim to attacks I assure you that you are just as, if not, more vulnerable. There was a time that wearing seat belts while driving was nothing more than a recommendation and very few folks applied it. The cars got faster, the accidents more menacing and now wearing seat belts is second nature to many. It took time and required a change in the way we think. The impacts of today’s web threats, although not as physically impactful as a car accident, carry with it huge life-altering challenges for us all and will carry similar changes int he way we think and interact with the web. Take the proper precautions and surf smartly.